The 5 at the Top! Situated in the northern panhandle of the Shropshire Hills, the Wrekin dominates the surrounding landscape. It’s a feature of many of the society's rides, although more often than not it serves as a reference point, giving us a vague idea of how far from home we are. However, over a bottle of two of vin rouge, the newly energized off road chapter of the society decided it was time to tackle this ‘hill’ on two wheels. 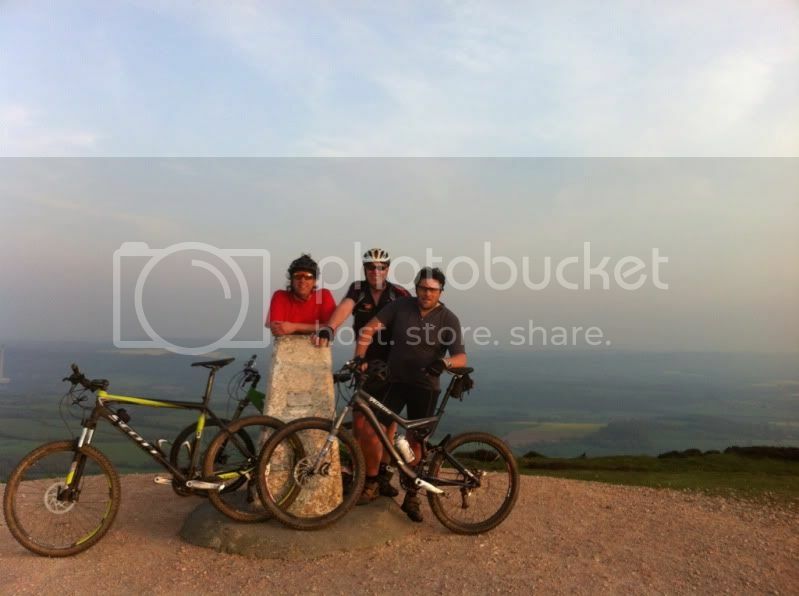 The Wrekin has a lot to offer for cyclists, from the fairly testing ascent of the main climb to the summit, to banzai downhill tracks which disappear off down the main ridge of the hill. As a ‘wheels on the ground’ sort of off road cyclist I'm more interested in the challenge of the ascent than the descent, and in particular riding it ‘clean’ with no dabs. Three of us lined up to tackle the ride. Mart was keen to get some more mud on his newly acquired Scott Scale, Scott had dug out his trusty Stumpjumper, and I was on the ever versatile Orange 5. We met at Mart’s, and after the routine pre-ride faffage, we were soon off and rolling. As we made our way through Wellington, the target was clear; the Wrekin looms large over this town. The climbing soon starts as you turn right off Holyhead Road and cross the M54. 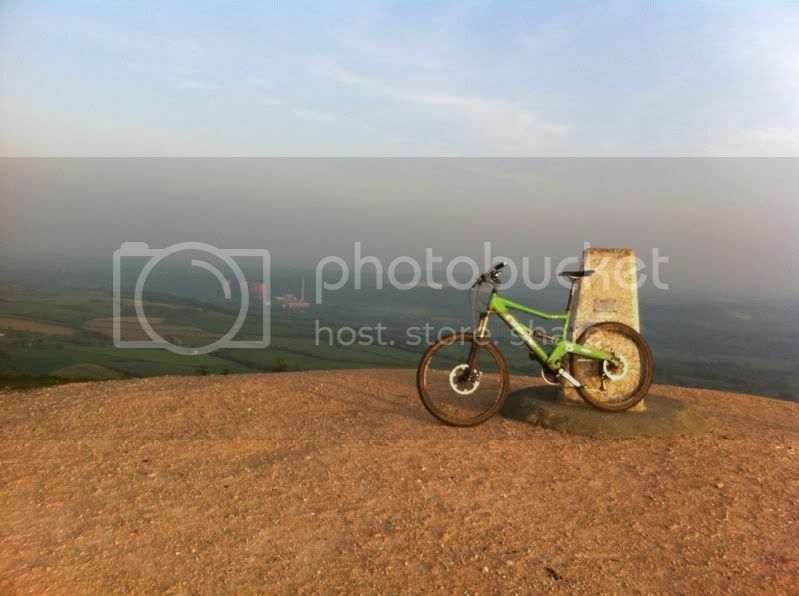 The shoulder of the Ercall offers some singletrack as rest bite from the road that passes the Buckatree Hotel and delivers you to the bottom of the Wrekin proper. I’ve ridden the Wrekin a few times over the years, and like any climb I know well, I tend to break it into logical sections. The first of the three sections i break the Wrekin into takes you from the start of the main track up the hill to the hairpin bend just past the ‘Halfway House’. It starts steep, very steep, and it becomes clear why the 22T chainring was invented! The surface is good, but the water drainage channels keep you on your toes. As the gradient eases slightly, there’s a chance to take a breather before you turn right up and past the rather inappropriately named building mentioned above. Climbing hills can often play tricks on the mind, and confronted with what I saw next, I was convinced it was happening again. Up ahead was a very fit looking chap, standing over a beer barrel! A few words confirmed that I wasn’t imagining things, and that he was carrying it to the top! Absolutely insane, but chapeau to the guy for doing it. One sector down, two to go! The first half of the second sector sees the gradient, although always steep, ebb and flow slightly as you slowly wind your way up through the trees. It rears up again as you approach a false brow. Once over it you break free of the tree cover, the last few minutes suddenly seem worthwhile. Visibility wasn’t great, but the views across towards Shrewsbury and beyond went some way to taking my mind off the fact that my lungs were trying to escape from by chest. You can even grab a few gears back as you make the most of the next hundred or so metres of flat. However, the view ahead makes it quite clear that you’ve still some way to go. This is probably the steepest part of the climb, and the surface is at its worst at this point. Much of it's very poor concrete, although if you hug the left side there’s a much better single track option to be had. Head down, it’s time to just keep it spinning as I inch my way towards the second false brow of the climb. The View from the top is quite simply stunning. Across the Gorge in one direction, the Shropshire Hills to the South, and the wide open North Shropshire plain behind you. All that was left now was the descent. The bit I enjoy about the Wrekin least if I’m honest. I think Martyn’s knees would probably agree…. A great ride though on a lovely evening, and well worth the effort! Makes my legs hurt again just reading about it!!!! Great achievement! I've done it many times and still maintain that it's one of the toughest workouts. Much tougher than running!